The beleaguered global music industry says it expects to see an increase in music sales next year. New legal download services combined with an anti-piracy campaign have given the industry cause for optimism. Keith Jopling, head of market research at the International Federation for the Phonographic Industry, said: "We are turning a corner." Global sales of CDs have fallen for several years but there are encouraging signs that they too are improving. 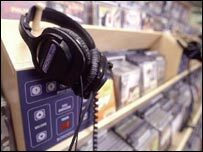 Music sales world-wide fell by 7.6% in 2003, the fourth consecutive year that sales had declined. While downloaded music accounts for 1% or 2% of sales currently, Mr Jopling said it could account for 4% or 5% by next year. He said the global industry was looking to the United States see how the market could recover. CD sales in the US have risen 9.4% in the year to date, said Mr Jopling. "If this is the result of a combined formula of anti-piracy lawsuits knocking people off file-sharing sites and the massive adoption of legal services and a spike in CD sales then it could be good news for everyone." But there is still some way before the recovery will be complete. 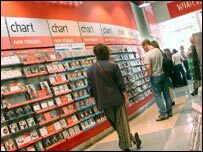 On Monday, EMI, the world's third largest record label, announced an annual loss of £52.8m, with CD sales slipping 2% to £1.7bn. The firm forecast that this year the global music market would stand still, at best, or shrink by 4%. But it too felt that there was cause for optimism. "We are optimistic that after this year we might see growth. It depends on sales of digital music which is exploding, albeit from a small base," said EMI chairman Eric Nicoli. Mr Jopling said he believed that new download services such as Napster, iTunes and Rhapsody had fuelled a resurgence of interest in music. He said: "I have a theory that there is something about these services such as iTunes and Napster which is sparking an interest in music which is leading to increase physical sales. "The people joining legal services are music fans who have a chance to get excited about music again. "What we are most happy about, so far, most people who are consuming music online are buying CDs as well." He said that the online services were also informing people about new music something, something the industry had struggled with previously.